Minister David Eggen and members of the new Alberta Anti-Racism Advisory Council at their first meeting. Minister Eggen will have two co-chairs on the Anti-Racism Advisory Council: Heather Campbell and Lucenia Ortiz. Campbell is a practising licensed professional engineer and procurement manager with the Alberta Electric System Operator. Campbell is a member of the advisory council for Western Engineering, sits as vice-president of the board of directors of Downstage Theatre and is a board member of Arts Commons. Ortiz is a planner with the City of Edmonton’s Citizen Services. Ortiz is a founding member of the Edmonton Multicultural Coalition and a member of the Multicultural Health Brokers Co-op. Ali is the owner and publisher of Express Media Network Ltd. where he launched Weekly Canadian Express, one of Western Canada’s largest South Asian newspapers, covering Calgary, Edmonton and Fort McMurray. Ali also publishes South Asian Xpress Magazine and hosts the Sangeet Studio Radio show. Ali is a board member for the Asian Heritage Foundation and the South Asian Canadian Seniors Society. Aujla-Bhullar is a public school teacher in Calgary and a PhD candidate in the Werklund School of Education at the University of Calgary. Her current work centres on exploring multi-ethnic and multicultural community engagement within schools as part of present-day inclusive education measures. Her work with community organizations includes local and national initiatives within the Sikh community and she is a member of the South Asian Police Advisory Committee for the Calgary Police Service. Bastien is the NorthStar parent connector at Opokaasin Early Intervention Society in Lethbridge. She provides one-on-one support, wraparound support services and cultural programming for families. Bastien participates in the Blackfoot Traditional way of life within the Blackfoot Confederacy. Bukhari is a multimedia professional working as a planner in channel management for the City of Calgary. Bukhari is also an adjunct professor at Columbia College where she teaches human rights and diversity courses. She is the founder and CEO of the Canadian Cultural Mosaic Foundation. Camara is an integration and community liaison agent with Centre d’acceuil et d’etablissement of Northern Alberta, establishing and maintaining contact with French multicultural communities in Edmonton. Camara has been actively involved in the Guinean community and sits on the board of directors for Institut Guy-Lacombe de la Famille (Parent Link Centre) in Edmonton. Eagle Child is a student counselor at Red Crow Community College. She is an executive member of the Apiistamiiks – White Buffalo Trail Blazers, a grassroots group fighting against racism, hate and discrimination in Southern Alberta. She has served as the co-chair of the Employment and Education subcommittee with the City of Lethbridge’s Interagency Group, and chair of the Student Success and Retention working group under the Iniskim Education Committee at the University of Lethbridge. Embaie is a practising, licensed immigration consultant and has volunteered with not-for-profit local, provincial, national and international organizations for over 25 years, including as president and board member of the Southern Alberta Heritage Language Association and as founding member and president of the African Community Association of Calgary. Fernando is a community-based environmental monitoring instructor at Keyano College. Fernando formerly served as the secretary and chair of the governance committee for the Pride Centre of Edmonton and the vice-chair of Some Other Solutions crisis prevention centre. Fernando is a registered professional forester and a mental health advocate. Gomaa is an associate clinical professor, researcher and educator at the faculty of medicine and dentistry at the University of Alberta. Gomaa serves as the Interfaith Portfolio chair in the Edmonton Council of Muslim Communities, contributes to the city’s commemoration of Remembrance Day and organizes Islamic history month at city hall. Hasan is the vice-president and chief operations officer at Hasco Development Corporation. Hasan is active in the community including as vice-president of civic engagement for the Alberta Muslim Public Affairs Council and board member for Al Mustafa Academy and Humanitarian Society. Hassan is a doctoral student at the University of Alberta. She has extensive community and youth development experience within several multiracial/multicultural immigrant communities in Toronto, Ottawa and Edmonton. Hassan is a board director at the Edmonton Social Planning Council and a former support staff for the Toronto District School Board Task Force on the Success of Students of Somali Descent. Haymour is a business manager who works closely with the Canadian Arab Friendship Association (CAFA) to assist community members in areas such as filing government documents, accessing government resources and facilitating events. Haymour attends CAFA board meetings as a guest member. Iahtail is co-founder and executive director of Creating Hope Society, a society founded for the survivors of the Sixties and Seventies Scoop of Indigenous children in care. Iahtail is an active member of the Edmonton Coalition for Human Rights, Aboriginal coalitions, the Edmonton Aboriginal Leadership Team and Stony Plain Wapekin Leadership Team. Katiiti is the founder and president of RARICAnow, an organization for all LGBTQ refugees in Canada. Katiiti advocates for the rights of refugees by creating awareness of their existence in Canada and ensuring that newcomers and refugees learn Canadian culture and get support in navigating the refugee and settlement process. Kirumira is special advisor to the dean of international students at Augustana campus, University of Alberta. Kirumira chairs the International Student Engagement Committee and participates on the Bridging Program Advisory Committee and the International Week planning committee. Najmeddine is the executive director of the Al Rashid Group and leads all corporate functions for the organization. He is a board member with the American University of Beirut Alumni Foundation and a former board member with the Red Cross, and Community Interest Companies Association. Pogorzelski is the director of Indigenous Student Affairs, an instructor for the Dhillon School of Business at the University of Lethbridge and owner and operator of three business. Pogorzelski is a member of the U of L senate, board member with the YMCA of Lethbridge, president of the Rotary Club of Lethbridge Mosaic and board member of the chamber of commerce. Pogorzelski is also an appointed director for the Canadian Race Relations Foundation (CRRF) and sits as the CRRF advisor to the National Canadian Coalition of Municipalities Against Racism and Discrimination committee. Rahim is the director of fund development and alumni engagement at Bow Valley College. Rahim serves as a member and manages community relations on the Aga Khan Council for the Prairies, and is the communications member of the Management Committee for Generations: Multi-Generational Housing and Community Centre Campus Calgary. Shapiro is the former associate executive director of the Calgary Jewish Federation, overseeing all of its programming areas. She is a member of the Calgary Interfaith Council and a regular volunteer at the Calgary Interfaith Food Bank. Shapiro is a past board member for the Calgary Council of Christians and Jews and the Committee on Race Relations and Cross-Cultural Understanding. Sidhu is the WiseGuyz program facilitator and sexual health educator at the Centre for Sexuality in Calgary. Sidhu served as a member of the University of Calgary senate in 2013 and as an appointee of the students’ union representing the undergraduate student body. Velichka is a school board trustee with Peace River School Division No. 10. Velichka’s portfolios include Administrators’ Association, Teacher Board Advisory Committee, Transportation Liaison Committee, Audit Committee, Alberta School Boards Association Second Language Task Force, Clear Hills Trades Training, Council of School Councils Liaison Committee, Discipline Committee and the First Nations, Métis & Inuit Liaison Committee. Woo-Paw is owner and principle of Teresa Woo-Paw & Associates Ltd. Woo-Paw is a member of the board of directors for the Calgary Arts Foundation, chair of the Canadian Race Relations Foundation, board president of Action Chinese Canadians Together Foundation and is a founding member and current co-chair of the Asian Heritage Foundation. Le premier conseil albertain consacré à la lutte contre le racisme fournira son expertise et son expérience au gouvernement afin de l’aider à réaliser son engagement de mettre fin au racisme. Le conseil est constitué de 24 membres, en plus de M. David Eggen, ministre de l’Éducation, qui est chargé du programme gouvernemental de lutte contre le racisme. Les membres conseilleront le gouvernement pendant qu’il travaillera à l’élaboration de stratégies pour mettre fin au racisme et à la discrimination en Alberta. Il s’agit du premier conseil du genre dans la province. Plus de 300 Albertains ont soumis leur candidature pour devenir membre du conseil. Les membres ont été sélectionnés en fonction de leurs compétences en leadeurship et de leur expérience dans la défense des intérêts de diverses communautés. Le conseil comprend des personnes de toutes confessions et de toutes origines, qui proviennent de toutes les régions de la province. Le ministre Eggen sera appuyé par deux coprésidentes au Conseil consultatif de lutte contre le racisme : Mmes Heather Campbell et Lucenia Ortiz. Madame Campbell est ingénieure professionnelle agréée et chef de l’approvisionnement chez Alberta Electrical Systems Operator. Elle est également membre du conseil consultatif de la Western Engineering, vice-présidente du conseil d’administration du Downstage Theatre et membre du conseil d’administration de Arts Commons. Madame Ortiz est planificatrice pour les services au citoyen de la Ville d’Edmonton. Elle est également membre fondatrice de la Edmonton Multicultural Coalition et membre de la Multicultural Health Brokers Co-op. Monsieur Ali est propriétaire et éditeur de l’Express Media Network Ltd., entreprise qui a lancé le Weekly Canadian Express, l’un des plus grands journaux sud-asiatiques de l’Ouest canadien, distribué à Calgary, à Edmonton et à Fort McMurray. M. Ali publie également la South Asian Xpress Magazine et anime l’émission Sangeet Studio Radio show. Il est membre du conseil d’administration de la Asian Heritage Foundation et de la South Asian Canadian Seniors Society. Madame Aujla-Bhullar est enseignante dans une école publique de Calgary et candidate au doctorat à la Werklund School of Education de l’Université de Calgary. Son étude porte sur l’engagement communautaire pluriethnique et multiculturel au sein des écoles, dans le contexte des mesures d’éducation inclusives qui prévalent actuellement. 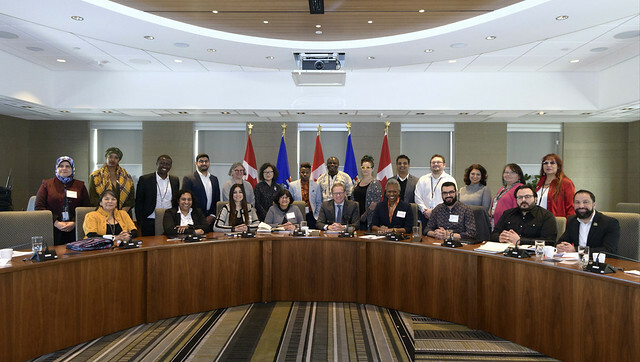 Dans le cadre de ses engagements communautaires, elle contribue à des initiatives locales et nationales au sein de la communauté sikhe et œuvre à titre de membre du South Asian Police Advisory Committee du service de police de Calgary. Madame Bastien est intervenante NorthStar en soutien aux parents avec la Opokaasin Early Intervention Society de Lethbridge. Elle offre un soutien individuel, des services d’encadrement et une programmation culturelle aux familles. Mme Bastien participe au mode de vie traditionnel des Pieds-Noirs au sein de la Confédération des Pieds-Noirs. Madame Bukhari est une professionnelle du multimédia qui travaille comme planificatrice en gestion des canaux pour la Ville de Calgary. Elle est également professeure adjointe au Columbia College, où elle donne des cours sur les droits de la personne et la diversité. Elle est fondatrice et directrice générale de la Canadian Cultural Mosaic Foundation. Monsieur Camara est agent d’intégration et de liaison communautaire pour le Centre d’accueil et d’établissement du Nord de l’Alberta. Il établit et maintient des rapports avec les communautés multiculturelles francophones d’Edmonton. M. Camara participe activement à la vie communautaire guinéenne, et il siège au conseil d’administration de l’Institut Guy?Lacombe de la famille à Edmonton. Madame Eagle Child est conseillère en orientation au Red Crow Community College. Elle est membre des Apiistamiiks – White Buffalo Trail Blazers, un groupe qui lutte contre le racisme, les crimes haineux et la discrimination dans le Sud de l’Alberta. Elle a siégé à titre de coprésidente du sous-comité sur l’emploi et l’éducation de l’Interagency Group de la Ville de Lethbridge, et comme présidente du groupe de travail sur la réussite et la persévérance scolaire des étudiants au sein du Iniskim Education Committee de l’Université de Lethbridge. Monsieur Embaie travaille comme consultant autorisé en immigration. Depuis plus de 25 ans, il fait du bénévolat auprès d’organismes locaux, provinciaux et internationaux sans but lucratif, dont à titre de président et membre du conseil d’administration de la Southern Alberta Heritage Language Association et comme membre fondateur et président de la African Community Association de Calgary. Madame Fernando est chargée de cours en surveillance de l’environnement au Keyano College. Elle a siégé à titre de secrétaire et présidente du comité de gouvernance du Pride Centre d’Edmonton, et comme coprésidente du centre de prévention des crises Some Other Solutions. Mme Fernando est une forestière professionnelle inscrite et une défenseure de la santé mentale. Madame Gomaa est professeure clinique agrégée, chercheuse et enseignante à la faculté de médecine et de dentisterie de l’Université de l’Alberta. Elle siège à titre de présidente de l’Interfaith Portfolio de l’Edmonton Council of Muslim Communities, contribue à la commémoration par la ville du jour du Souvenir et organise les célébrations du mois de l’histoire de l’Islam à l’hôtel de ville. Monsieur Hasan est vice-président et directeur de l’exploitation à la Hasco Development Corporation. Il participe activement à la vie de sa communauté, y compris à titre de vice-président de l’engagement civique pour l’Alberta Muslim Public Affairs Council et comme membre du conseil d’administration de l’Al Mustafa Academy and Humanitarian Society. Madame Hassan est étudiante au doctorat à l’Université de l’Alberta. Elle possède une vaste expérience en développement communautaire et en développement des jeunes au sein de plusieurs communautés d’immigrants multiraciales/multiculturelles à Toronto, à Ottawa et à Edmonton. Mme Hassan est membre du conseil d’administration de l’Edmonton Social Planning Council et une ancienne employée de soutien du groupe de travail sur la réussite des élèves d’origine somalienne pour le conseil scolaire du district de Toronto. Monsieur Haymour est un administrateur qui travaille de près avec la Canadian Arab Friendship Association (CAFA) pour appuyer les membres de la communauté dans leurs démarches, telles que la présentation de documents au gouvernement, l’accès aux ressources gouvernementales et l’organisation d’événements. M. Haymour assiste aux réunions du conseil d’administration de la CAFA à titre de membre invité. Madame Iahtail est cofondatrice et directrice générale de la Creating Hope Society, une société consacrée à l’aide aux survivants de la rafle d’enfants autochtones des années 1960 et 1970. Mme Iahtail est membre active de la Edmonton Coalition for Human Rights, de diverses coalitions autochtones, de la Edmonton Aboriginal Leadership Team et de la Stony Plain Wapekin Leadership Team. Monsieur Katiiti est le président fondateur du RARICAnow, organisme consacré aux réfugiés LGBTQ du Canada. Il fait la promotion des droits des réfugiés en sensibilisant les gens à leur présence au Canada et en voyant à ce que les nouveaux arrivants et les réfugiés apprennent la culture canadienne et qu’ils soient appuyés tout au long de leur processus de demande de statut de réfugié et d’intégration. Monsieur Kirumira est un conseiller spécial du doyen des étudiants internationaux au campus Augustana de l’Université de l’Alberta. Il préside le comité d’engagement des étudiants internationaux et participe au comité consultatif du programme de transition et au comité de planification de la semaine internationale. Monsieur Najmeddine est directeur général de l’Al Rashid Group et il dirige toutes les fonctions administratives de l’organisme. Il est membre du conseil d’administration de l’American University of Beirut Alumni Foundation et un ancien membre du conseil d’administration de la Croix-Rouge et de la Community Interest Companies Association. Monsieur Pogorzelski est directeur des Indigenous Student Affairs, chargé de cours à la Dhillon School of Business de l’Université de Lethbridge et propriétaire exploitant de trois entreprises. Il est membre du sénat de l’Université de Lethbridge et du conseil d’administration du YMCA de Lethbridge, président du Rotary Club de Lethbridge Mosaic et membre du conseil d’administration de la chambre de commerce locale. M. Pogorzelski est également directeur nommé de la Fondation canadienne des relations raciales (FCRR) et il siège à titre de conseiller de la FCRR auprès de la Coalition canadienne des municipalités contre le racisme et la discrimination. Madame Rahim est directrice du développement des fonds et de la fidélisation des diplômés au Bow Valley College. Elle est membre du Aga Khan Council for the Prairies et est responsable des relations communautaires de l’organisme. Elle est également responsable des communications pour le comité de gestion du centre Generations: Multi-Generational Housing and Community Centre de Calgary. Madame Shapiro est l’ancienne directrice générale associée de la Calgary Jewish Federation, où elle a supervisé tous les secteurs de programmation de l’organisme. Elle est membre du Calgary Interfaith Council et offre régulièrement ses services bénévoles à la banque alimentaire du conseil. Mme Shapiro est une ancienne membre du conseil d’administration du Calgary Council of Christians and Jews, et du Committee on Race Relations and Cross-Cultural Understanding. Monsieur Sidhu est animateur du programme WiseGuyz et éducateur en santé sexuelle au Centre for Sexuality de Calgary. Il a siégé au sénat de l’Université de Calgary en 2013 et a été nommé représentant de l’association des étudiants de premier cycle. Madame Velichka est conseillère scolaire de la Peace River School Division No. 10. Elle a occupé de nombreux postes, entre autres, auprès de l’Administrators’ Association, du Teacher Board Advisory Committee, du Transportation Liaison Committee, de l’Audit Committee, de l’Alberta School Boards Association Second Language Task Force, du Clear Hills Trades Training, du Council of School Councils Liaison Committee, du Discipline Committee et du First Nations, Métis & Inuit Liaison Committee. Madame Woo-Paw est propriétaire de la Teresa Woo-Paw & Associates Ltd. Elle est membre du conseil d’administration de la Calgary Arts Foundation, présidente de la Fondation canadienne des relations raciales, présidente du conseil d’administration de la Action Chinese Canadians Together Foundation et membre fondatrice et coprésidente actuelle de la Asian Heritage Foundation.